In the United States, policy often plays a role in deciding who gets labeled a terrorist. 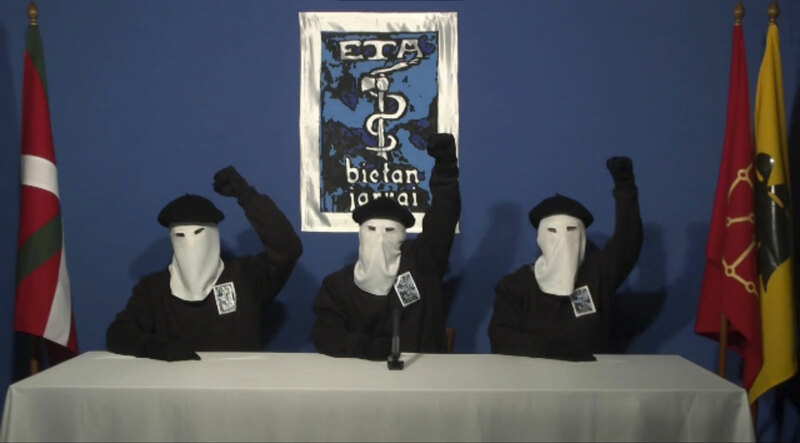 Three members of Basque separatist group ETA call a definitive end to fifty years of armed struggle, which has resulted in at least 850 deaths, in this still image taken from an undated video published on the website of Basque language newspaper “Gara,” on October 20, 2011.
it must threaten either U.S. national security or the security of U.S. citizens. But designating terrorist groups involves more than a definition. In practice, it is a policy decision. Once a group has been labeled an FTO, it is illegal for any U.S. citizen to provide the group with material support or resources. 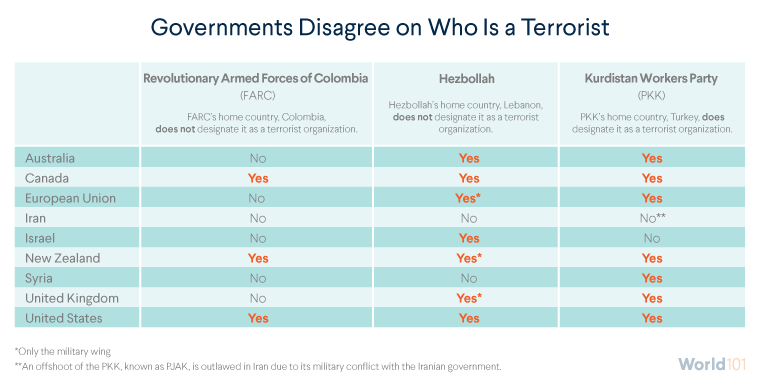 Political considerations are sometimes believed to play a role in determining whom the United States labels a terrorist. The Taliban in Afghanistan, for example, arguably meets the criteria for designation, yet the U.S. government declines to label it a foreign terrorist group because doing so could complicate future peace negotiations. Sometimes a designation distinguishes between different elements of the same organization. For example, the United States labels Hezbollah an FTO, but Russia and China do not. The European Union labels the group’s military wing—but not its political wing—a terrorist group. There are also steps that terrorist groups themselves take in order to skirt the designation. Sometimes, organizations establish branches or subsidiaries with varying degrees of support and affiliation. A prominent example is the group of Kurdish political and military groups attached to the Kurdistan Workers Party (PKK). The PKK, historically a separatist militant group based in Turkey, has long been classified an FTO by the United States. However, the U.S. government does not identify the party’s Syrian branch, the Democratic Union Party (PYD), or its armed wing, the People’s Protection Units (YPG), as terrorist organizations. In fact, the U.S. government provides the YPG military support in the fight against the self-proclaimed Islamic State. There are also questions about the consequences of publicly identifying terrorist groups. The designation of Boko Haram as an FTO was a topic of debate in the Barack Obama administration; some dissenters, for example, were concerned that formally labeling the group might raise its profile and boost its funding, as well as complicate the ability to continue humanitarian aid in the region. After a two-year debate, the State Department ultimately decided to designate Boko Haram as an FTO in 2013. FTO designations are not permanent, but FTOs must wait two years from the date of designation to launch an appeal. The State Department can also delist an FTO based on changing political circumstances in the United States or abroad. In 2008, President George W. Bush signed a bill to remove African National Congress leaders, including Nelson Mandela, from the U.S. terror watch list, fourteen years after Mandela and the party came to power in post-apartheid South Africa. Other governments and international institutions differ in their designation processes and resulting lists of terrorist organizations. Below are three examples of groups operating around the world—and who sees them as terrorists.